This is an amazing 3-hour tour if you are visiting St Kitts. in the Caribbean. Itineraries include visits to the 10-acre Romney Garden, the Caribelle Batik Studios, and the Brimstone Hill Fortress (also known as "The Gibraltar of the West Indies") which is the highlight of the tour! St. Kitts locals are all descendants from African slaves who worked in sugar plantations during the Industrial Revolution. Basseterre, St. Kitts has a vibrant culture and multicultural heritage. You will discover its signature landmarks which include both the French and English colonial architecture of Independent Square, the War Memorial and the Anglican Church. The Romney Garden is an old estate manor located at the edge of the rain forest surrounded by tropical gardens. The garden offers picturesque views, ideal for photographers who love to take photos focused on nature. 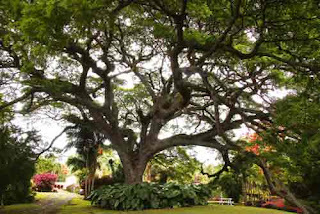 The most awesome view in the garden is an incredible 350 year-old Saman Tree with enormous branches that go down along the ground, and then going up again like another tree. Truly am majestic creation, only God can do! I have to borrow a photo since I wasn't able to take a photo of this tree while I was there :(. Probably because I was overwhelmed visiting the Batik Studios...;). It is at this location where local artists get their products used for fabrics that they make at Caribelle Batik Studios, for which they became widely acclaimed. They offer demonstrations about batik products' dyeing technique for free for visitors and customers who come and visit. Their batik products are popular sale! "Batik" is a term they call for a painted cloth made with colorful pattern of different designs. No wonder why visitors love to buy them. The last and the highlight of the tour is a visit to the 300-year old Brimstone Hill Fortress located on a 40-acre hilltop at 750 ft. above sea level. Its astounding scenic and spectacular views offers high rolling green hills, with brightly-colored villages at the bottom, all surrounded with the sparkling blue ocean. Don't miss visiting the museum, gun ports and bastions of the historic mountainside fortification. The next 100 years after its first cannons were built in 1690 showed the intermittent construction of an amazing work of architectural and engineering ideas, which is now well-preserved providing scenic views of the coastline, the countryside and the five neighboring islands.